Chatting with Jose on the bus. 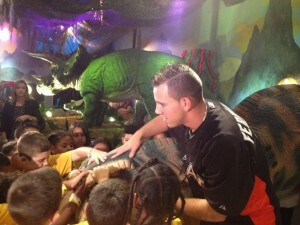 Yesterday the Billy’s Bunch crew was able to spend the morning with newly named All-Star pitcher Jose Fernandez. He was taking kids from the Kiwanas summer camp of Little Havana to the Miami Children’s Museum for a special outing. 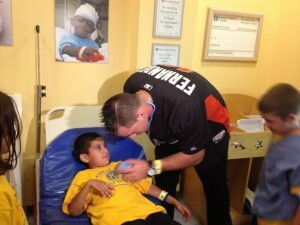 We met him at the stadium, and rode with him on the Fox Sports Florida, Marlins Fan Express bus to pick up the children. On our way there, I chatted with him about his upcoming trip next week to New York for his first ever MLB All-Star game. He’s psyched! And the story of how he learned that he was named to the All-Star game is pretty funny. Even funnier is how he broke the news to his poor mama. Click below to watch my interview. Can’t believe he’s only 20, and the 2nd youngest pitcher to be selected as an All-Star. Marlins All-Star Pitcher Jose Fernandez from Kristen Hewitt on Vimeo. The one thing that immediately struck me is that Jose was on time. Shocking right? The night before, the Marlins game had gone 14 innings against the Braves, and he was tired. When Fernandez rolled up at 10:30am I said, “I can’t believe you’re here, after such a long night, and not late.” He replied, “I may be Cuban but I’m always on time”. After doing some interviews with my kid reporter Lauren (who really is a young lady at this point, not a kid!) and me, we headed to Little Havana to pick up 35 Kiwanis campers. The kids were so excited to see him, and Jose greeted each one. A little girl actually swooned! Then he took time to pose with the ones that couldn’t come with us. So he did. He went down the slide. Played doctor with them. And even had fun in the dinosaur exhibit! And most importantly he talked to them. He asked them questions. He made them feel like they were important and interesting, and he even talked to a few about manners, kindness and listening. What an amazing experience for these kids, something they will never forget. And what an incredible role model. It’s hard to believe that Jose was drafted at 18 years old in 2011, and at only 20 has such maturity. He said over and over again to me, “I’m just a kid!”. And considering most guys his age are in college that may be true…but he proved that he is more than just a kid. He’s a humble man, savoring every moment of his Major League experience. Congratulations to a most deserving athlete, I can’t wait to see his debut at the 2013 All-Star game! To see the rest of what we shot that day, tune in to Billy’s Bunch on August 3rd on Fox Sports Florida. And by the way…I’m totally taking my kids to Miami Children’s Museum!